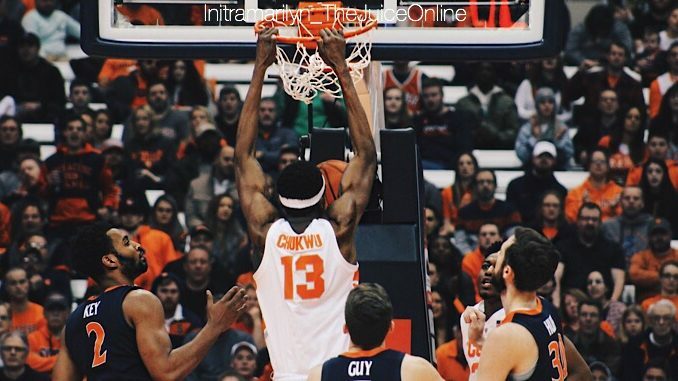 Syracuse center Paschal Chukwu dunks against Virginia. Mandatory Photo Credit: Initra Marilyn, The Juice Online. WHAT HAPPENED: Syracuse was slotted eighth in the West region, where they will play ninth-seeded Baylor in the first round of the NCAA Tournament. Syracuse finished 20-13 overall and 10-8 in the ACC. The Orange’s resume wins included Quad 1 games at Ohio State, at Duke and hosting Louisville. It’s the Orange’s highest seed since 2015 when it was named a No. 3 seed. Baylor finished fourth in the Big 12 at 10-8 with a 19-13 overall record, but they lost their last four games. Bears guard Makai Mason, a Yale transfer, averaged 14.6 points and 3.3 assists per game. ANALYSIS: When it comes to the NCAA Tournament, it’s all about the matchups. In recent memory, teams that are familiar with the Orange are understandably less rattled by SU’s 2-3 zone. Since joining the ACC, Syracuse is 8-2 against non-ACC teams and 3-7 when playing ACC teams in the postseason. There is only one ACC team in the West Region, fourth-seeded Florida State, and the Orange need not think about FSU until the Sweet 16. In the meantime, Gonzaga, the top seed in the region, would await SU in the second round. HERO: The ACC earned seven NCAA Tournament bids, including three No. 1 seeds in Virginia, Duke and North Carolina. The Tournament Selection Committee tries its best to avoid inter-conference matchups in the first and second rounds, which allowed the Orange to avoid those regions. For head coach Jim Boeheim, it is SU’s 34th NCAA selection in his 43 year coaching career. ZERO: One ACC team that was left out of the NCAA Tournament was NC State. Though the Wolfpack had a NET ranking of 33, it was hurt by its non-conference SOS, which was a league-worst 353. But out of its conference wins, only one came against an NCAA Tourney team (Syracuse), while it had bad losses against Wake Forest (twice) and Georgia Tech. As it turns out, the Wolfpack wasn’t close, with UNCG, Alabama, TCU and Indiana as the first four out. WHAT’S NEXT: A trip to Salt Lake City where Syracuse will play on Thursday.